Erin Folger is July’s Athlete of the Month. One year ago this month, she walked into our doors and never looked back. 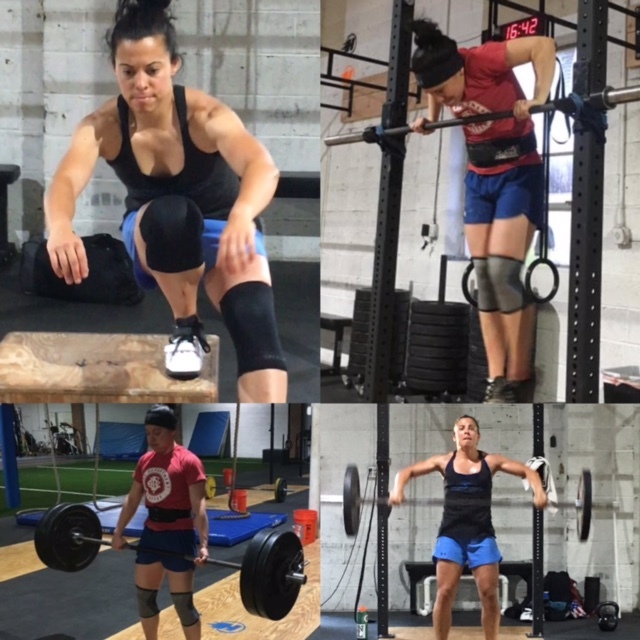 Read more about this amazing athlete who proves that CrossFit can be done by anyone – no matter your fitness level or coming back from an injury/surgery. How did you learn about CrossFit and how did you end up in our awesome Box? I really became interested in CrossFit after watching a documentary on Netflix. However, I never thought I’d ever be able to try those workouts that seemed so demanding, because I had trouble with my knee after having ACL surgery. Eventually, I decided to find out more, so I began to look for boxes nearby. Hyper CrossFIT stood out above the rest, because of the emphasis on modifying workouts to keep members injury-free. I thought that was the perfect philosophy for someone like me coming back from a serious injury…and I was right! What do you like most about being a FIT member (Hyper CrossFit Athlete)? The first thing I noticed at Hyper was how friendly and welcoming everyone was, coaches and athletes. I felt comfortable right away, and a year later, the gym feels like home. I especially love how the coaches don’t hesitate to jump right in and workout right beside you. I never have to workout alone. What is your proudest moment/biggest accomplishment since you started? Since I hurt my knee, I’ve struggled to get back into shape and to feel like myself again. I would rush into working out, overdue it, and get hurt again. It was a never-ending cycle. Since joining Hyper, I’m most proud of how I approached returning to exercise–being patient, modifying movements, and taking care of my body. That accomplishment is very meaningful to me. And I have my coaches to thank for that, as well. What are you still working on to achieve? I want to be as strong as Coach Kim! I don’t think that’s possible though, so I’ll settle for getting handstand walks and muscle-ups. Tell us one random fact about yourself that has nothing to do with CrossFit. I have six fake teeth. What is your favorite WOD or benchmark? So far, I think my favorite is DT. Murph was a memorable one, too. But I haven’t been CrossFitting that long, so there are a lot that I haven’t tried yet. If you created a WOD and named it after yourself, what would it be? That’s a hard question. I like long workouts, so maybe a long AMRAP. It would probably include running, squat cleans, pull-ups, double unders, and burpees. I would name it “The Best Part of Waking Up” (my last name is Folger). What advice would you offer to someone interested, but intimidated to try CrossFit? ANYONE can do it! You just need to be willing to try. Hyper is the perfect place to start, because the coaches are willing to modify any workout to meet your needs and make sure you stay healthy enough to come back again and again. And once you start, you won’t want to stop! Any additional comments you would like to share? Thank you to the Hyper coaches for their support and to the Hyper members for welcoming me with open arms! Marine Corps Sgt. Michael C. Roy, 25, of North Fort Myers, Fla., assigned to the 3rd Marine Special Operations Battalion, Marine Special Operations Advisor Group, Marine Corps Forces Special Operations Command at Camp Lejeune, was killed in action on July 8th, 2009 in Nimroz Province, Afghanistan, while supporting combat operations. He is survived by his wife Amy and three children, Michael, Landon and Olivia.